At a Hollywoodian event (as almost all smartphone launches are nowadays) in Barbican Centre on Thursday, Xiaomi became the latest Chinese smartphone maker to introduce their latest products in London, following recent launches by Huawei and OnePlus. The company unveiled Mi 8 Pro, an upgrade version of its Mi 8 model launched earlier in China. After registering impressive growth in India and other markets in Asia, as well as consolidating its position in China, Xiaomi, like some other Chinese brands, is eyeing the mature markets for new growth. Western Europe is an attractive option as the market is not flooded with hundreds of smartphone brands as in India and China, and there is a sizeable open market that is easier for new brands to set a foot in instead of having to crack the carrier market as in the US. 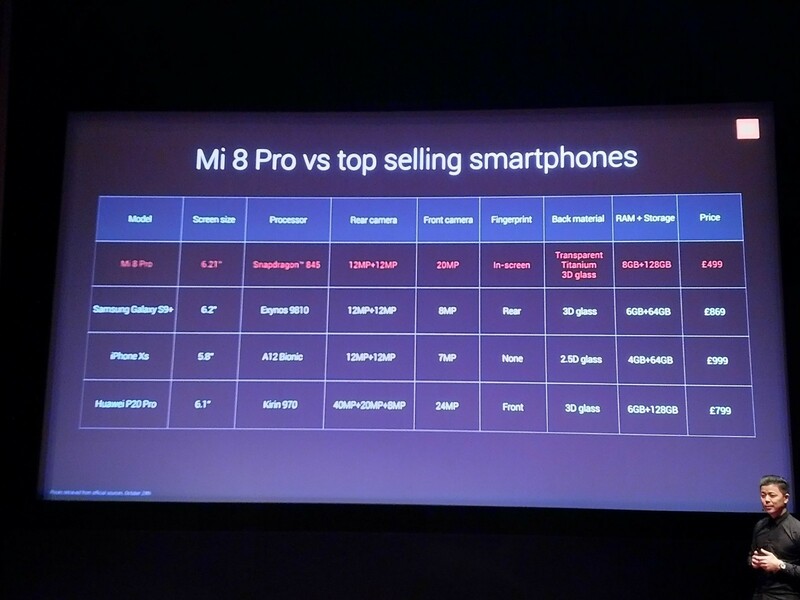 The newly launched Mi 8Pro and its predecessor share exactly the same hardware and software, powered by Qualcomm’s Snapdragon 845 CPU, 6.21” AMOLED display (yes, need to go to the second decimal digit), 8GB RAM and 128GB onboard memory,12MP+12MP AI dual camera on the back, and 20MP selfie camera, Dual 4G SIM, Dual frequency GPS (to minimise coverage dead zones, like near tall buildings), infra-red facial recognition (to unlock with facial ID in the dark). On the software side, Xiaomi overlayed a light MIUI skin on top of the latest Android release, plus a couple of its own preloaded apps (browser, messaging, etc.). Presumably the main point is not how many people will use its apps but rather to gather usage data. The Xiaomi executives did stress the number of active MIUI users in the world and in Europe (its products are already being sold in Spain, Italy, and France). It has also preloaded a MS Office suite, one of the first offers Microsoft made to the Android ecosystem back in 2016. Under the spotlight was its photography technologies including the so-called “4-in-1” super-pixel, that is combining 4 pixels into 1 to take in more light, therefore to capture more details even in low light environment. Also being boasted is the speed the phone focuses (using the so-called Double Pixel Auto Focus, DPAF, technology, demonstrated in a video as faster than both the iPhone XS and the Samsung S9+). Nowadays, no presentation of smartphone cameras is complete without talking AI, and Xiaomi is no exception. The main talking point here was on the analytics capability to separate foreground from background, making post-shot processing easier. The only genuine upgrade the Mi 8 Pro offers over the Mi 8 looks to be the fingerprint reader. It is at the back of the phone on the Mi 8, but is upgraded to on-screen reader on the Mi 8 Pro. All the bells and whistles aside, what Xiaomi most wanted is to stand out in two areas: design and price. It is clearly successful in one, maybe less so in the other. Xiaomi claimed to go down the minimalist route for its design, claiming that it was inspired by the exhibits at the Helsinki Design Museum. It even got the director of the museum to go on video to endorse an earlier product. But what it got to show its innovative design on the new product is a transparent back-cover where the upper part of the inside of the phone is visible. But to those of us old enough to remember the 1990s, this is more a retro than inno. Swatch’s Skeleton series, anyone? But when it comes to pricing the strategy is much bolder and more likely to succeed. Xiaomi broke through in the device market in China in 2011 by offering smartphones with decent specs at a very affordable price. This strategy has carried them through ups and downs all the way to London. The Mi 8 Pro will be retailed at £499.99. This is vastly lower than other smartphones with comparable hardware specs. Xiaomi is clearly targeted at the so-called “affordable premium” segment. On the distribution side, Xiaomi started in China exclusively using online distribution channels. There have been followers with mixed success, but at the same Xiaomi is also diversifying to brick-and-mortar retail outlets in markets like India, Malaysia. Xiaomi also aims at a mixed channel strategy in the UK, it opens its own online shopping channel, getting online and offline channel partners (Amazon, Currys, Carphone Warehouse, Argo, John Lewis, etc.) on board, as well as opening its own authorised retailer in southwest London on 18 November. It also tied a partnership with 3UK, though Xiaomi executives would not tell more details of the terms or the packages 3 plans to offer. Also introduced to the UK market at the event are a smart wristband (Mi Band 3, main feature being its display larger than previous generations) and an electric scooter, to deliver the “ecosystem” story—the executive stressed Xiaomi is more than a smartphone company. On display in the experience area were also smart speakers, set-top boxes, smart kettle, and smart scale. Our overall feeling is that, the Mi 8 Pro smartphone is decent but not fantastic. However the price point Xiaomi sets it on is disruptive. This strategy has worked for the company in China and other Asian and European market, taking them to commendable market positions and financial success. It may stand a chance.